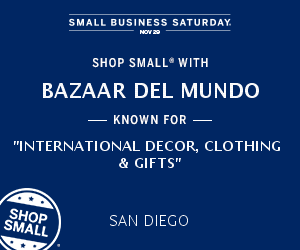 Join us at Bazaar del Mundo on Nov. 29th for a merry environment to get started on your holiday shopping. Browse our collection of folk art, jewelry, home accessories and collectibles from all around the world, creative fashion, arts and crafts, hundreds of cookbooks and whimsical ornaments to adorn your Christmas tree! For a shopping break, dine locally next door at Casa Guadalajara. Sip a frosty margarita and try one of the new healthy dining creations such as Ensalada de Carne Asada – grilled and marinated carne asada with sliced avocado, tomatoes, queso cotija, sliced radishes, spring mix of romaine and cilantro lime dressing (390 calories). When you shop at Bazaar del Mundo or eat at Casa Guadalajara, know that you’re supporting small businesses in your neighborhood. This entry was posted by The Bazaar del Mundo on November 17, 2014 at 8:26 pm, and is filed under Events. Follow any responses to this post through RSS 2.0. You can leave a response or trackback from your own site.